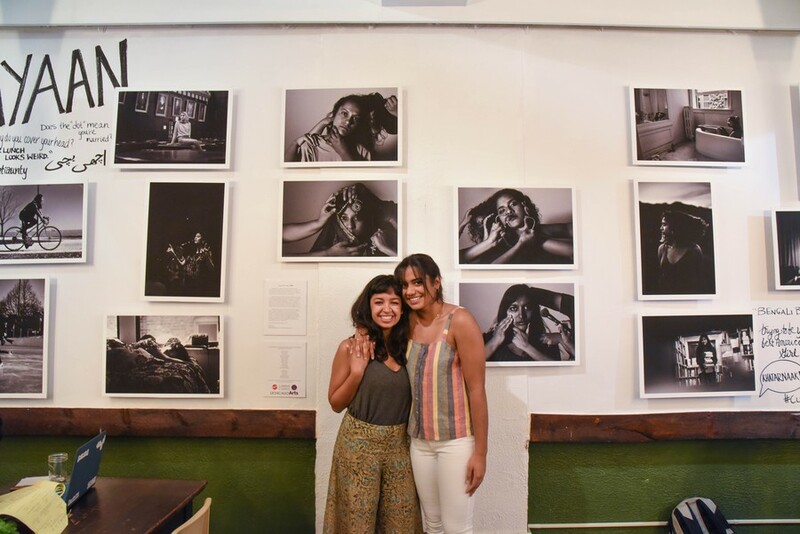 Fatima Khan and Shreya Sood pose next to their artwork. 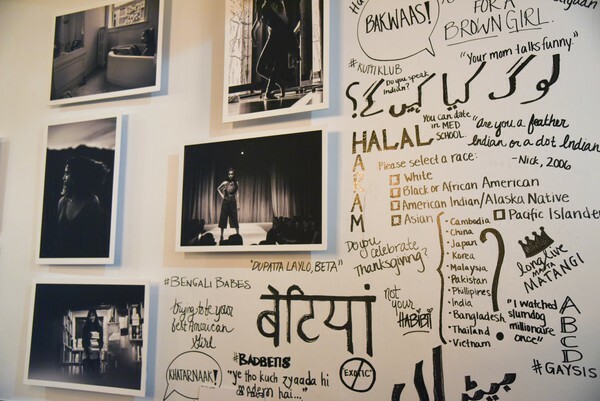 Entering Sanctuary Cafe, one is immediately greeted by the artwork on its walls: Hindi, Urdu, and English text clustered around a series of black and white photographs. 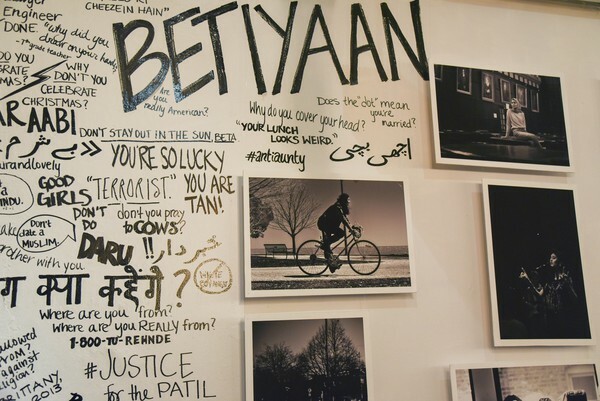 The title of fourth-years Fatima Khan and Shreya Sood’s installation is scrawled above in big letters: Betiyaan. Translated as “Daughters” from both Hindi and Urdu, the word is rife with cultural connotations that complicate the primarily filial denotation of the word. The photographs, taken by Khan, capture other students of various desi identities. They explore South Asian pluralism, the toxic vestiges of historical rivalries, racism directed toward brown identities, and the importance of dialogue in fostering minority solidarity. “For the majority of my life, I found myself repressing my cultural identity or…[not knowing how] to be around really racist people,” said Khan, who grew up in a predominantly white suburb near Chicago. “Coming here, I experienced the inverse of that, where it was almost fetishized.” Khan and Sood drew several of the phrases scrawled on the wall from experiences with American racism, such as “You smell like cumin” or the especially derogatory “You’re pretty for a brown girl.” However, the South Asian-American experience goes beyond white microaggressions. “I’ve spent a lot of time reflecting on certain backwards mentalities that come out of our own cultures as well,” Sood explained. “I’ve always struggled with how to embrace my culture, to represent and advocate for it, [despite the] things about my culture that I’m not proud of…. 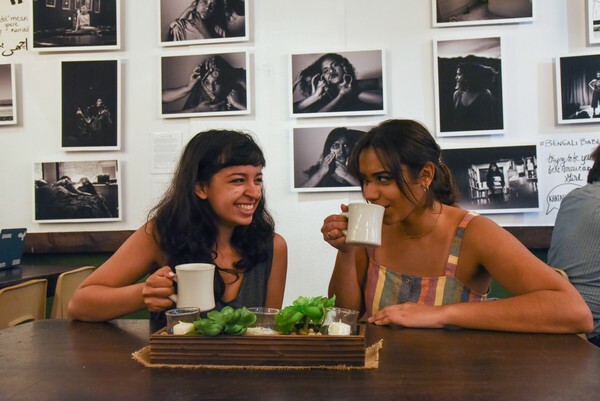 But those things aren't static: they evolve through conversation.” With other work by artists of color on display, Sanctuary Cafe seemed like an appropriate platform for the artists to propel the kind of dialogues they hope to foster. Betiyaan was also born out of numerous conversations between Khan, Sood, and others who contributed to the exhibit. For example, third-year Megha Bhattacharya illustrated the design on Betiyaan’s Facebook page and the posters around campus. The project had started with photography, as Khan’s interest in the medium had “evolved from a hobby to a side hustle to an exhibition the past year,” during which she refined her editing and framing skills, did on-campus assignments, and created an impressive online portfolio. For Betiyaan, she drew inspiration from activist photography, a lot of which is black-and-white, with high contrast and striking use of shadows. An official gallery reception for Betiyaan will be held on May 17 and will feature live performances by sundry South Asian artists. Khan's photographs capture other students of various desi identities, not just fourth-years (as the article previously mentioned).